Everyone is asked to help research and expose how some newspapers use the horrid “Nazi” abbreviation to cover-up for the monstrous National Socialist German Workers’ Party, in a vain effort to rehabilitate socialism. CONTEST: There is also a contest for the most shocking research results, and for the most shocking responses from the media about the results, and for the best letters to the editor exposing guilty newspapers. Many newspapers have websites with archive search engines that reveal how often the full phrase has been used (if ever) for comparison with a newspaper’s hackneyed use of the horrid words “Nazi,” “Nazis” and “Nazism.” Some media outlets have never written the full phrase, but use the abbreviations so often that their search engines cannot display all the results. 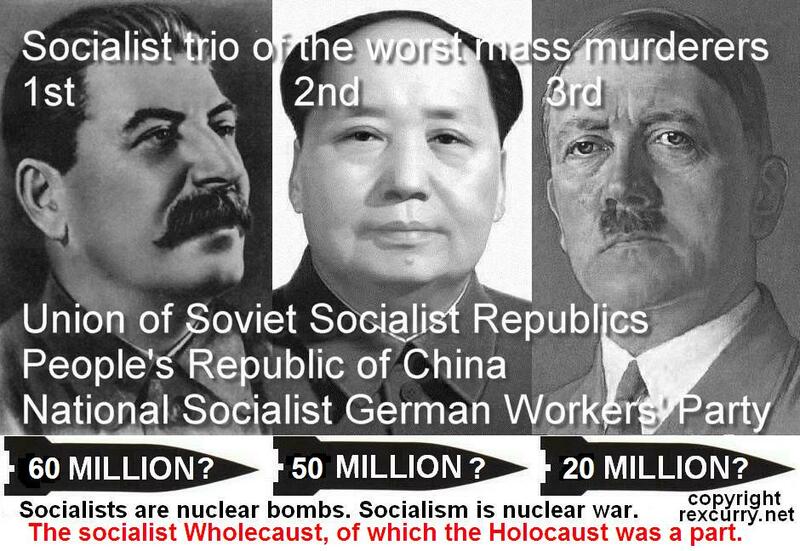 For example, recent searches of the websites at the Seattle Times, the New York Times and the St. Petersburg Times, showed either no incidents or hardly any incidences of their writers having written in their papers: National Socialist German Workers' Party. On D-Day, the media routinely commemorate the June 6, 1944 Allied invasion of Europe in WWII. Media everywhere drone on about "Nazis" and not a single one will use the full phrase even once, as shown in a recent Google "News" search. Google provides free "News Alerts" which enable anyone to receive instantaneous email alerts for anything, including the hackneyed abbreviation and it's full phrase. WARNING: Do not request alerts for the abbreviation, as your inbox will be busy with repetitious media cliches. Feel free to request alerts for the full phrase, as your inbox will be lucky to ever see one (and if an alert comes, it will probably be about something I wrote, such as this article). Some media are anti libertarian, and their authoritarian bias is so great that they use the horrid word “Nazi” exclusively and never inform the public of the full phrase of the monstrous group. Or to put it into the words that the media prefer, they are word nazis about the word "Nazi." They use it to cover-up for the nasty National Socialist German Workers' Party. The media’s widespread dishonest practice is so extensive that most people no longer know that “Nazi” is an abbreviation for “National Socialist German Workers’ Party.” Government schools and the media have covered-up for so long that even most journalists do not know what the hackneyed abbreviation abbreviates. It is more proof that government schools must end, and that government schools (socialized schools) teach lies for socialism. The media exploit and perpetuate the rampant ignorance. Please report the results (in plain text) with the website url addresses to rexy@ij.net at http://rexcurry.net without attachments. Please also send the results as a letter to the editor to the newspapers along with a letter such as the one below, calling each newspaper’s attention to its dishonest practice and exposing it. OF THE ORIGINAL STRAIGHT-ARM SALUTE IN THE U.S.
"Nazi" is an abbreviation for the horrid "National Socialist German Workers' Party" as every dictionary states. I hope that you will inform the public about the meaning of the horrid abbreviation. Some media outlets cover-up for the monstrous "National Socialist German Workers' Party" via exclusive use of the hackneyed abbreviation. A news-making court case about the Pledge of Allegiance went before the U.S. Supreme Court. The history of the pledge is suppressed because it is so unlibertarian. Some media outlets are already covering up the fact that the original salute to the U.S. flag resembled the salute of the National Socialist German Workers' Party, that the pledge's author (Francis Bellamy) was a famous National Socialist in the U.S. in 1892, and that the U.S. Pledge of Allegiance is the origin of the salute of the National Socialist German Workers' Party, which some media outlets refuse to identify fully. http://rexcurry.net/pledgesalute.html There are many other ominous parallels about the Pledge of Allegiance. 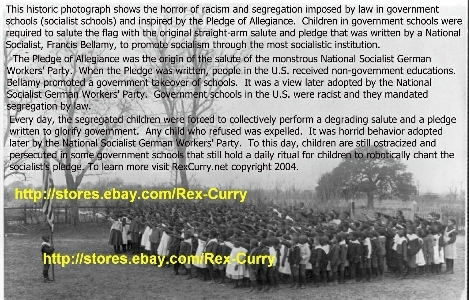 (astounding historic photos and information about the pledge are at http://rexcurry.net/pledge2.html ). If a writer uses an abbreviation (such as "Nazi"), then the abbreviation should be fully identified at it's first use in an article (even parenthetically) if not more often (for example: National Socialist German Workers' Party). This letter is sent to ask you to fully inform the public about the history of the Pledge of Allegiance and to fully expose the horrid National Socialist German Workers' Party. Of the times when your paper printed the word "Nazi" I can not recall a single time when your paper identified the abbreviation as the "National Socialist German Workers' Party." In fact, I cannot recall your paper ever writing "National Socialist German Workers' Party." Is it an official policy of your paper to never write "National Socialist German Workers' Party"? Your website search tool for your archives indicates that you have never used, or almost never used, the full phrase. In comparison, the words "Nazi" and "Nazis" and "Nazism" have so many hits that your search program cannot display them all. Or to put it into the words you prefer, you are word nazis about the word "Nazi." You use it to cover-up for the nasty National Socialist German Workers' Party. How many of your writers have written the full phrase ever in their lives? If you print my letter, I might be the first person in your paper to inform the public of the full phrase. Please confirm that I am correct about all of the above. And the pledge court case is ongoing, and each year provides V-E Day, Memorial Day, D-Day, Flag Day and many other opportunities in the future to write about the horrid National Socialist German Workers' Party issues and to show the public whether you will or won't ever be truthful about the full phrase. We'll all be watching.